Mt. Joy Orchard on Munjoy Hill is growing fruit for the community, but more importantly, it is growing relationships among neighbors, and is teaching children important lessons. Amy Googins, a teacher at the East End School, and her first- and second-grade students were the first to plant apple trees at the site, shortly after the school opened about a decade ago. East End was an expeditionary learning school, and one of its first “expeditions” was to create a project that would be useful to the community. In order to come up with a project, Googins made a few calls and eventually was put in touch with John Bunker, an expert on heritage apples and a founder of Fedco Seeds. He snagged some apple tree seedlings for Googins – and soon the orchard was off and growing. In the years since, the orchard on North Street near the Eastern Promenade has expanded; another group of students at East End School planted more trees (and did a project comparing the parts of the trees to parts of the human body). The orchard now has more than 50 apple trees, among them Oxford and Baldwin trees, and includes both unusual heritage varieties and more traditional Maine varieties. Although it started with the students, “I see this as a school and community orchard,” Portland city arborist Jeff Tarling said. Part of his job is to coordinate the many groups that help maintain the orchard, including Cultivating Community (a local nonprofit that promotes healthy food), The Resilience Hub permaculture organization, the Friends of Forest City Trees, Portland residents with plots in the adjacent community garden, Fedco and the Maine Organic Farmers and Gardeners Association. The orchard also falls under the Mayor’s Initiative for a Healthy and Sustainable Food System, a three-year-old project that encompasses many local food projects. 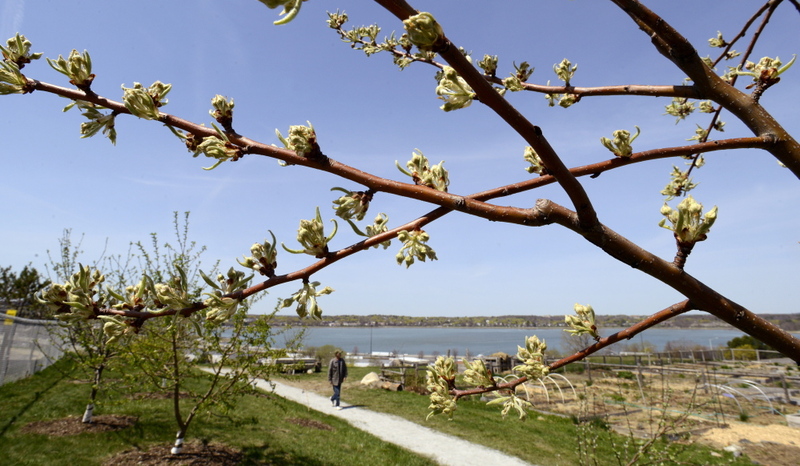 The orchard also has lessons to teach people who stroll to the top of Munjoy Hill for the fantastic views and stumble on the fruit trees: it introduces them to efforts to grow local food. Having an orchard within a city might seem unusual, but there’s historical precedent. Waite Maclin, an apple expert with the Friends of Forest City Trees, said his group has planted fruit trees at other schools in the city too, including Reiche and Riverton, so other areas are also enjoying the fruits of the trend. Alongside the apple trees, the Mt. Joy Orchard has peach and pear trees, Cornelian cherries, high-bush blueberries and elderberries. A wildflower meadow grows nearby. Since the trees are young, they aren’t yet bearing much fruit. (The students have made applesauce with some of the apples, however.) Eventually, any residents of Portland will be able to pick fruit from the orchard, said Googins and Cultivating Community’s Laura Mailander. To date, they added, no one has tried to pick the trees clean. Even if that were to happen, though, given the wide variety of trees in the orchard – some apples ripening in midsummer and others in late fall – no one could get all the apples, anyway. Eventually, Cultivating Community hopes to put up signs naming each tree variety and listing when it is likely to be ready for picking. Tarling is thrilled by the willingness of different groups and individuals to help maintain the orchard. One time, he noticed a man by himself at Mt. Joy Orchard building mulch rings around the trees. Tarling approached the man, an immigrant, who told Tarling that he had tended apple trees in his native country and it made him feel good to do the same work here. The orchard teaches cooperation. It teaches healthy eating habits and lessons of local food. It teaches young people about farming. Beyond all these, it’s helping newcomers to America feel like old-timers.